It is already common knowledge that individual investors do not usually have the necessary resources and abilities to properly research an investment opportunity. As a result, most investors pick their illusory “winners” by making a superficial analysis and research that leads to poor performance on aggregate. Since stock returns aren’t usually symmetrically distributed and index returns are more affected by a few outlier stocks (i.e. the FAANG stocks dominating and driving S&P 500 Index’s returns in recent years), more than 50% of the constituents of the Standard and Poor’s 500 Index underperform the benchmark. Hence, if you randomly pick a stock, there is more than 50% chance that you’d fail to beat the market. At the same time, the 15 most favored S&P 500 stocks by the hedge funds monitored by Insider Monkey generated a return of 19.7% during the first 2.5 months of 2019 (vs. 13.1% gain for SPY), with 93% of these stocks outperforming the benchmark. Of course, hedge funds do make wrong bets on some occasions and these get disproportionately publicized on financial media, but piggybacking their moves can beat the broader market on average. That’s why we are going to go over recent hedge fund activity in Banco Bilbao Vizcaya Argentaria SA (NYSE:BBVA). Banco Bilbao Vizcaya Argentaria SA (NYSE:BBVA) has experienced a decrease in hedge fund sentiment of late. BBVA was in 4 hedge funds’ portfolios at the end of the fourth quarter of 2018. There were 6 hedge funds in our database with BBVA positions at the end of the previous quarter. Our calculations also showed that BBVA isn’t among the 30 most popular stocks among hedge funds. We’re going to analyze the new hedge fund action regarding Banco Bilbao Vizcaya Argentaria SA (NYSE:BBVA). What does the smart money think about Banco Bilbao Vizcaya Argentaria SA (NYSE:BBVA)? At the end of the fourth quarter, a total of 4 of the hedge funds tracked by Insider Monkey were bullish on this stock, a change of -33% from the previous quarter. By comparison, 9 hedge funds held shares or bullish call options in BBVA a year ago. With hedge funds’ capital changing hands, there exists a select group of noteworthy hedge fund managers who were increasing their holdings substantially (or already accumulated large positions). 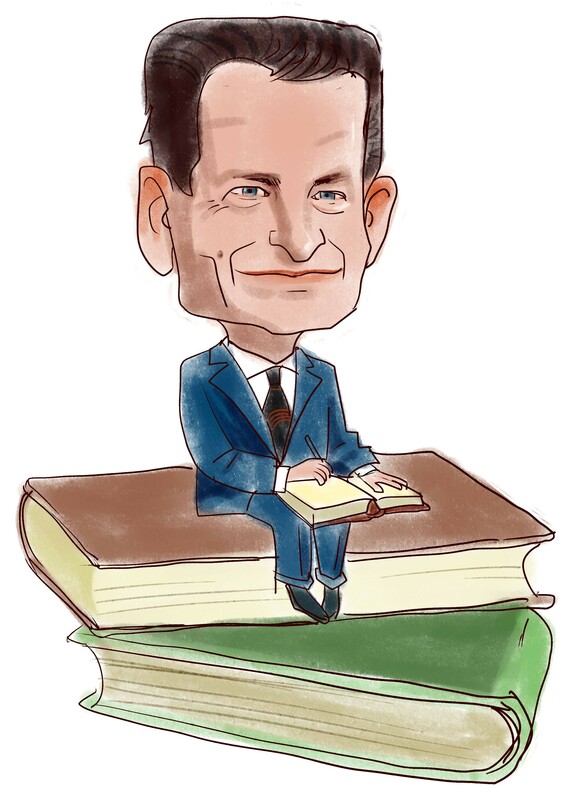 According to Insider Monkey’s hedge fund database, Ken Fisher’s Fisher Asset Management has the largest position in Banco Bilbao Vizcaya Argentaria SA (NYSE:BBVA), worth close to $233.1 million, amounting to 0.3% of its total 13F portfolio. Coming in second is Two Sigma Advisors, managed by John Overdeck and David Siegel, which holds a $1.4 million position; the fund has less than 0.1%% of its 13F portfolio invested in the stock. Other members of the smart money that are bullish encompass Matthew Tewksbury’s Stevens Capital Management, Ken Griffin’s Citadel Investment Group and . Judging by the fact that Banco Bilbao Vizcaya Argentaria SA (NYSE:BBVA) has experienced a decline in interest from the aggregate hedge fund industry, it’s easy to see that there exists a select few funds who sold off their entire stakes last quarter. It’s worth mentioning that Ric Dillon’s Diamond Hill Capital dumped the largest investment of the 700 funds watched by Insider Monkey, valued at close to $0.7 million in call options, and Matthew Hulsizer’s PEAK6 Capital Management was right behind this move, as the fund cut about $0.5 million worth. These transactions are interesting, as total hedge fund interest dropped by 2 funds last quarter. Let’s go over hedge fund activity in other stocks – not necessarily in the same industry as Banco Bilbao Vizcaya Argentaria SA (NYSE:BBVA) but similarly valued. These stocks are The Progressive Corporation (NYSE:PGR), Air Products & Chemicals, Inc. (NYSE:APD), Workday Inc (NASDAQ:WDAY), and Carnival plc (NYSE:CUK). This group of stocks’ market values are similar to BBVA’s market value. As you can see these stocks had an average of 30.75 hedge funds with bullish positions and the average amount invested in these stocks was $1066 million. That figure was $235 million in BBVA’s case. The Progressive Corporation (NYSE:PGR) is the most popular stock in this table. On the other hand Carnival plc (NYSE:CUK) is the least popular one with only 8 bullish hedge fund positions. Compared to these stocks Banco Bilbao Vizcaya Argentaria SA (NYSE:BBVA) is even less popular than CUK. 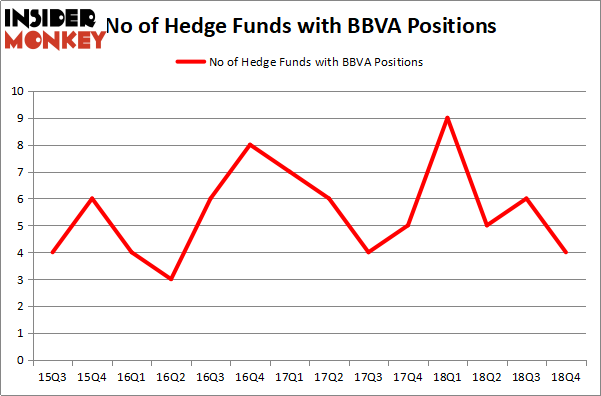 Hedge funds clearly didn’t like BBVA in Q4 and some of them sold out their holdings. Our calculations showed that top 15 most popular stocks among hedge funds returned 19.7% through March 15th and outperformed the S&P 500 ETF (SPY) by 6.6 percentage points. Only a few hedge funds were also right about betting on BBVA, though not to the same extent, as the stock returned 14.9% and outperformed the market as well. Is Illinois Tool Works Inc. (ITW) A Good Stock To Buy? Were Hedge Funds Right About Getting Into Bank of Montreal (BMO)? Were Hedge Funds Right About Dumping FedEx Corporation (FDX)? Were Hedge Funds Right About Ecolab Inc. (ECL)? Is Vertex Pharmaceuticals Incorporated (VRTX) A Good Stock To Buy? Were Hedge Funds Right About Selling Northrop Grumman Corporation (NOC)?